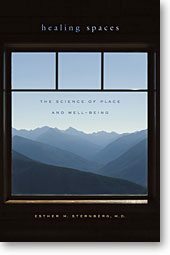 Healing Spaces – The Science of Place and Well-Being – by Esther M. Sternberg, M.D. Dr. Esther Sternberg, M.D. immerses us in the discoveries that have revealed a complex working relationship between the senses, the emotions, and the immune system. First among these is the story of the researcher who, in the 1980s, found that hospital patients with a view of nature healed faster than those without. How could a pleasant view speed healing? The author pursues this question through stories, including her own experiences in series of places and situations that explore how what you see, hear, smell, touch, and do in a place can help heal and prevent disease – or the opposite – can stress you and make you ill. The book shows how a Disney theme park or a Frank Gehry concert hall, a labyrinth or a garden can reduce stress or trigger it, induce anxiety or instill peace. If our senses can lead us to a “place of healing,” it is no surprise that our place in nature is of critical importance in Sternberg’s account. She ends the book with a moving description of her mother’s garden and her own place of peace, to introduce how the health of the environment is closely linked to personal health. The discoveries this book describes point to possibilities for designing hospitals, communities, and neighborhoods that promote healing and health for all. The Balance Within – The Science Connecting Health & Emotions – by Esther M. Sternberg, M.D. For years, believers in common wisdom and New Age gurus have claimed that a healthy spirit will result in a healthy body. But without scientific proof, doctors have not been able to explain or support that belief. As recently as ten years ago, the immune system was believed to be autonomous, with no connection to the brain. Esther Sternberg, M.D., and other researchers are now making advances that show the actual pathways connecting the areas of our brain that control immunity with those that generate feelings and thoughts. In THE BALANCE WITHIN: The Science Connecting Health and Emotions (W.H. Freeman and Company/May 8, 2000/$24.95 Hardcover) Dr. Sternberg explains the mechanisms and their significance: how nerves, molecules, and hormones connect the brain and immune system, how the immune system signals the brain and affects our emotions, and documents how our brain can signal the immune system, making us more vulnerable to illnesses. They have not only discovered the links, but have demonstrated how they work and what the implications can be for treatable and chronic diseases. What you’ve known intuitively (that being exhausted or stressed can make you more vulnerable to illness) is now understood scientifically. Ultimately, she answers our pressing, relevant questions: Will stress make us sick? Will believing make us well? Why do we feel sick when we get sick? How does our health affect our moods? Until now there has been a lot of speculation about these questions, especially from the New Age shamans, but no serious, informed answers. THE BALANCE WITHIN provides these answers and explains clearly and engagingly how it happens. Author and Medical Researcher Dr. Esther Sternberg hosts the PBS Pledge Special The Science of Healing. Produced by the Emmy award-winning Resolution Pictures, the program aired in November/December 2009. The Science of Healing follows Dr. Sternberg to a tiny village in Greece, where her personal experience of the power of place in healing inspired the research that led to this program. We join her as she explores ruins of ancient Greek healing temples, and visits cutting edge science labs to uncover the source of her healing. In the course of her journey we learn more about the scientific basis of the mind-body connection, and the role of environment and emotion in the healing process. The program introduces viewers to the research that is revealing some of the many ways the brain helps us heal, both emotionally and physically. By understanding the science behind the brain’s role in healing, we can each take charge of our own health and find out how to create a place of peace even in troubled times. Dr. Sternberg is currently Professor of Medicine and Founding Research Director for the Arizona Center for Integrative Medicine at the University of Arizona at Tucson. She is the Founding Director of the UA Institute on Place and Wellbeing, and holds joint appointments at UA as Professor in Medicine and Psychology. Dr. Sternberg offers keynote presentations, public speaking engagements, and literature regarding the science of mind-body interaction in illness and healing and the role of the built and natural environment on health and wellbeing. To get in touch with Dr. Sternberg, please use this form.